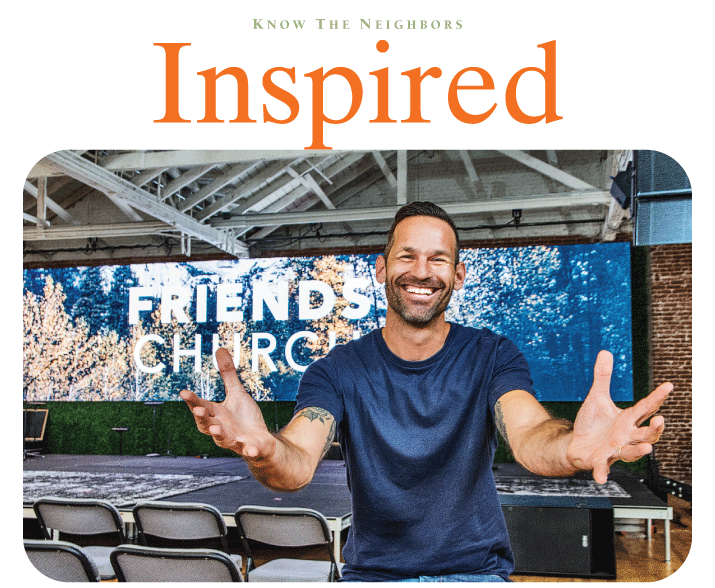 After raising $1.5 million to remodel the old packing house, Pastor Jay Hewitt led Friends Church in a “Renovate Celebrate” event after the congregation’s move three years ago. The historical Orange packing house was once a place for sorting and processing fruit and in recent years stood abandoned. That changed three years ago when Friends Church moved in. Led by Pastor Jay Hewitt, Friends Church has made its mark in the community and on its members. Friends Church is a community filled with honesty and free from judgment, says member and former Director of Operations, Nancy Foster. “The church is a place where it doesn’t matter where you are in your life or what your experiences are. You’re just accepted,” she says. With more than 1,000 members, the Evangelical church, located in Old Towne, has grown quickly, and Hewitt is proud to lead the congregation. Last year, when Hewitt was diagnosed with an incurable brain tumor, he shared his experience with the congregation and was astonished at their immediate support. That’s not the only miracle that has occurred for Friends Church. Prior to the church moving into the packing house, the building was riddled with crime and had police officers reporting to the scene weekly. At the church’s renovation event, Hewitt says that officers displayed graphs that indicated there had been zero crime activity since Friends Church opened. Hewitt was inspired by the renovation of the packing house and hopes to continue making changes—not just structurally, but also spiritually—throughout the City of Orange.